It was a once-in-a-lifetime moment for yiayia Kyriakoula Kontakos when Federal Member for Port Adelaide Mark Butler awarded her his annual Local Legend Award in acknowledgement of her extraordinary contribution to the community during her 40 years of service. “I am overwhelmed with joy when I help people around me,” the 90-year-old told Neos Kosmos. Kyriakoula was born in 1928 in a small village outside of Neapoli in the prefecture of Lakonia in the southeastern Peloponnese. While she didn’t have the opportunity to obtain any formal education, she says she has learnt a lot through her life experiences. “I learned the biggest and most important lesson; to be kind and generous towards people, particularly those in need,” she says. “My family back in the village was really poor. I was one of eight siblings and had to work very hard from a really young age to contribute to the household and support my family, until my parents decided it was time for me to get married,” she revealed. Yiayia Kyriakoula married in Greece in 1949 and migrated to Australia in 1954, and recalls spending her first few years here working day and night as a cook in restaurants around Adelaide. “[I worked] with the sole purpose of providing my three children with an education and a more promising future. At the same time, I promised myself that as soon as my children stood on their own two feet and managed their future, I would dedicate the rest of my life to charity,” she said. “Work doesn’t scare me. If anything, it makes me feel alive and strong and I take offence when people tell me to slow down. Interestingly, yiayia Kyriakoula, whose humanitarian work extends across Australia, Africa and Greece, believes work isn’t what makes people tired, but on the contrary it energises them making them feel alive and strong. “It’s loneliness, sadness and heartache that makes people get sick and feel tired, therefore, I encourage everyone to get involved in their community and become a volunteer so that they can feel useful and offer their assistance to those in need. We can all make a difference if we want to,” she said. To this day, Kyriakoula chooses to wear second-hand clothes and leads an extremely humble life, and says that she lives on the bare minimum so she can save and then “give away my money to those less fortunate”. 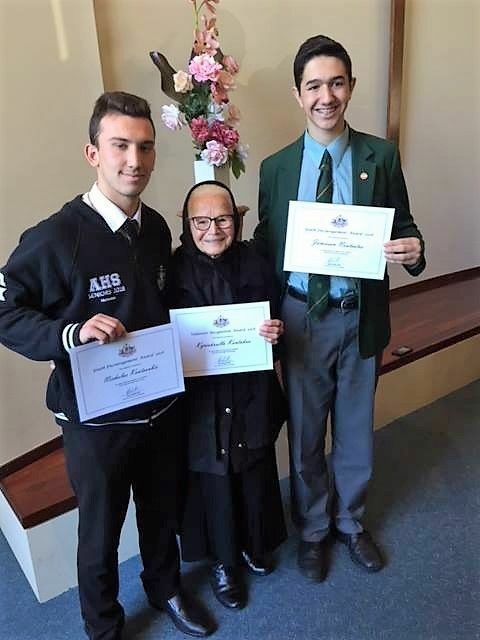 She has demonstrated this philanthropy as one of the longest serving volunteers at the Greek Orthodox Community of Port Adelaide, with 26 years of service under her belt. “Our own Kyriakoula is a daily inspiration to all of us,” Port Adelaide Greek Community president John Douvartzidis told Neos Kosmos. “Her selfless deeds and attitude drives us all to be better people for our community. Yiayia Kyriakoula has already packed her suitcases and is ready for her next adventure, heading back to Greece to visit her extended family. “Nothing scares me,” she says.